Wat Muang Ang Thong. 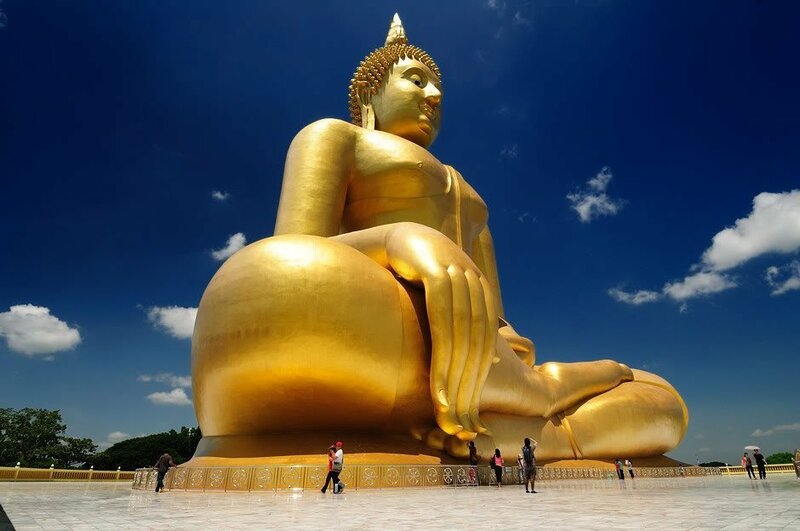 Thailand’s Largest Buddha Wat Muang Ang Thong. Wat Muang is home to The Big Buddha, also known as Phra Buddha Maha Nawamin and Mahaminh Sakayamunee Visejchaicharn, which is the tallest Buddha statue in Thailand and the ninth tallest in the world.Located in the Wat Muang Monastery in Ang Thong province, this statue stands 92 m (300 ft) high, and is 63 m (210 ft) wide. Construction commenced in 1990, and was completed in 2008. It is painted gold and made of concrete. Ang Thong (Thai: อ่างทอง), is one of the central provinces (changwat) of Thailand. The name means “golden bowl”, an allusion to Ang Thong’s agricultural importance. Neighboring provinces are (from north clockwise) are Sing Buri, Lopburi, Ayutthaya, and Suphanburi. Ang Thong native handicrafts include moulded court dolls, firebrick, and wickerwork. There are more than 200 temples in Ang Thong. There are several other important attractions in the temple. The ubosot of Wat Muang is surrounded by the biggest lotus petals in the world. Ground floor of Wihan Kaeo is a museum (open only on Saturday and Sunday during 09.00 – 17.00 hrs.) exhibiting sacred objects, antiques, and figures of renowned monks from all over the country. 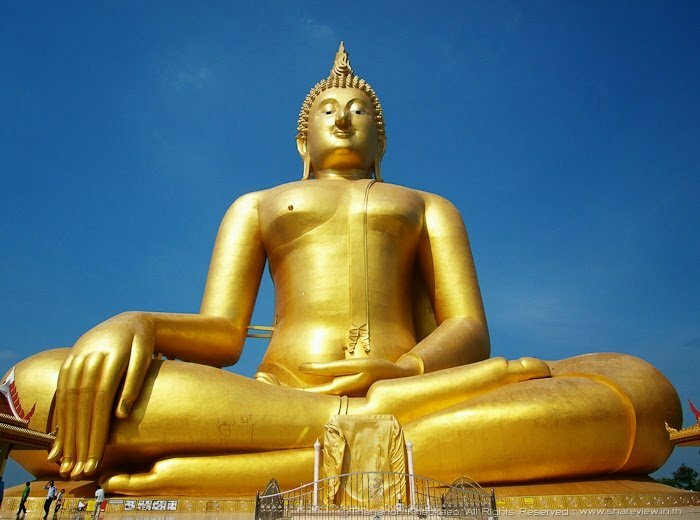 The upper floor of the museum houses the first and largest silver holy Buddha image of the country, which was constructed in commemoration of the 50th anniversary of His Majesty the King’s throne ascendancy. Within the temple compound, there are figures of heaven and hell, Thai god paradise, Chinese god paradise, and a huge statue of Kuan Im female goddess. Besides, there are figures narrating the history of Thai-Burmese battle in Wiset Chai Chan.